A photographer is always looking for new camera bags, but there always seems to be a new one on my mind. I was looking for a camera backpack that I could keep a camera body and lens attached while carrying a few extra lenses and accessories. I don’t use a backpack often, but I have the ThinkTank Shape Shifter and it works well, but I can’t fit a body with a lens attached into that backpack. I had the chance to try out the new Ruggard Thunderhead 35 DSLR & Laptop Backpack courtesy of B&H. The Ruggard Thunderhead 35 is a small camera backpack meant for small kits or mirrorless systems. There’s plenty of room inside for a body and lens attached, and 3-5 other lens pockets for accessories. You can easily fit a 70-200mm on one side of the bag or down the middle. My friend James and I decided to put it to the test and go hiking in the Adirondack mountains last week. Here are my thoughts on the bag. I could fit my entire kit in this backpack. There was plenty of room for my Sony A7r Mark II with 2 lenses, extra batteries, lens wipes, etc. We also tried James’ Canon kit, with 3 lenses and a flash – it fits great as well. The inside of the bag is a light color, so any little black pieces that fall into the bag can be easily found. It’s very easy to re-arrange the bag – all you have to do it move a few velcro padded pieces. It’s a perfect size bag for day trips or moving gear around. 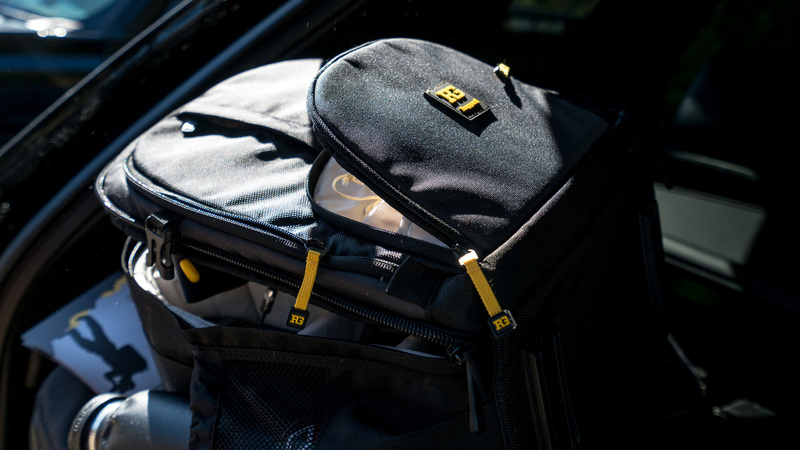 In the lid of the backpack, there’s room for small cables and accessories. The pockets aren’t very large, but cables, remote shutter releases, and memory cards will fit with ease. It also has a padded laptop sleeve, which fits laptops up to 13”. I have a 15” MacBook Pro, but I was able to use that pouch for my iPad and any travel documents. The bag is very padded (which normally is good), but that makes the bag stick out a lot from my back. When James was carrying it, it doubled the width of his body. If you lay the lenses down inside the bag, there’s definitely room between the top of the lens and the top flap of the bag, so it could stand to be a little narrower. The straps to the bag have at least an inch of padding as well. After a long hike, I didn’t mind the padding, but it’s very unnecessary for short hauls with the bag. This includes the hip flaps, which were too padded to ignore. They felt weird tucking them between your back and the bag like I do with other bags when I don’t need them. Given that the pack was so small, it rode up high on my back. I tried to adjust the straps to lower the pack, but I never could get it to the perfect spot. This meant that the waist straps would ride above my belly button, which just felt weird. There are a lot of positives with the bag, but there is always a way to make things better. I’d look to reduce the padding by almost half, making the bag a little more useful for shorter trips or everyday use. I’d like a way to lower the hip straps so they sit lower on my back or find a way to pull them back under or into the bag when I don’t need them. There was a point when I considered cutting them off because they were in the way. The best part of the bag? Aside from holding a lot of gear for being so small, this bag also comes with a small price tag. In a market of $200-$300 camera backpacks, the Ruggard Thunderhead 35 is under $99.95. So even if I only use it on a few trips throughout the year, it’s still a great backpack. If you need something a little larger, there are even 2 larger models still under the $200 range – just be cautious of how much weight you’re carrying when you put a full kit in the bag. This bag looks huge and puts too much weight too high up on the back. I hurt just looking at you walking around with this.